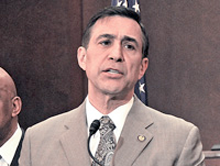 Congessman Darryl Issa, Republican of California, speaking in Congress in 2011. As Chair of the House Committee on Oversight and Government Reform of the U.S. House of Representatives, Rep. Issa was chair of a hearing on the recently enacted health care reform law. As Chair, he had control of the witness list. One of the witnesses he chose to exclude was Sandra Fluke, who was nominated as a witness by the minority party. Ms. Fluke would have testified to the need for the law's provisions with respect to the prescription of medically necessary contraceptives, a position with which Rep. Issa disagreed. In barring Ms. Fluke's testimony, Rep. Issa's actions provide us with an example of a bully chair ejecting those regarded as challengers. Photo courtesy U.S. Government General Accountability Office. We conduct meetings to facilitate collaboration. We collaborate because we believe that groups have more and better answers and insights than individuals do. But some meeting chairs take a different approach. Instead of eliciting contributions from everyone, these bully chairs impose their own views on the group, limiting the contributions of the attendees. To impose their will successfully, they cloak their intentions in the appearance of collaboration. They find ways to make the imposition of their will seem necessary and proper. Here's Part II of a collection of tactics used by bully chairs. See "When the Chair Is a Bully: I," Point Lookout for June 20, 2012, and "When the Chair Is a Bully: III," Point Lookout for July 4, 2012, for more. Since bully chairs often have influence over the attendee list, they can sometimes choose not to invite those they regard as troublemakers. If the definition of making trouble is disagreeing with the chair, or criticizing positions that the chair favors, group decision quality suffers. When an attendee stops attending, and you suspect that the absence is a result of the chair's actions, the meeting is deprived of the contributions of someone who was initially regarded as a valuable contributor. Log these incidents. They contribute to the picture of the bullying pattern, and they demonstrate how the bullying is degrading the meeting's performance. Social, political, or organizational structures protect some attendees from ejection by the chair. Nevertheless, the chair might be able to limit attendee participation in ways that seem innocent or constructive. For instance, the chair might delegate to a carefully selected "task force" the responsibility for making a recommendation to the meeting as a whole. That recommendation might then be subjected to limited discussion, which constrains disfavored attendees as they try to modulate the recommendation. By themselves, these tactics don't support charges of bullying. But in the context of an array of tactics targeted at disfavored individuals, they can be convincing evidence of the chair's abuse of power. their own views on the groupof disfavored attendees entails moving meeting discussions to electronic media that the disfavored attendees cannot access conveniently or cannot access with regularity, or which they do not have time to learn how to use effectively. This tactic has the appearance of fairness, but still manages to limit the effectiveness of the disfavored. These decisions can help demonstrate the chair's bias if the chair has strongly advocated for using the technologies over the strenuous objections of the disfavored. The chair's actions become more clearly questionable if incorrect decisions result from inadequate airing of issues due to technology-based restriction of the participation of disfavored attendees. Would you like to see your comments posted here? rbrenENMDggYYMqiixlZyner@ChacMhIqezRmDoGXTuKDoCanyon.comSend me your comments by email, or by Web form. I offer email and telephone coaching at both corporate and individual rates. Contact Rick for details at rbrenBOJKymzsAracuLJiner@ChacWWiapqZdYYTnOXJXoCanyon.com or (650) 787-6475, or toll-free in the continental US at (866) 378-5470.